In front on an audience that included influential Cuban legend Luis Tiant, the Red Sox introduced budding superstar infielder Yoan Moncada to reporters at JetBlue Park on Friday. The 19-year old phenom hopes that it won't be too long before fans at Fenway Park get a firsthand look at him. �My goal is to make it to the big leagues in a year," Moncada told reporters, via Red Sox�international scouting director Eddie�Romero. While his aim to make an impact in the big leagues sooner rather than later was clear, Moncada also seemed to realize that this journey may take a bit longer. �I'm just looking forward to getting back on the field and playing baseball,� Moncada said on launching his career in the big leagues according to The Boston Globe's Alex Speier. �It's been so long... I want them to see me as a dedicated teammate and a good guy." Getting to this point was not easy for Moncada, who has not seen his family for nine months and counting. The high-priced prospect got emotional when describing the role agent David Hastings played in getting him to the cusp of the major leagues. Moncada said Hastings was �like his father� to him in Cuba. "It was tough overall being the first time going through something like this,� Moncada told reporters. �[The] Red Sox [are a] great organization and players... [I'm] looking forward to the opportunity to play for the Red Sox. Most of all, [I'm] looking forward to getting on field." Red Sox GM Ben Cherington says that the team hopes Moncada can experience �something he hasn't in several months: baseball normalcy,� according to Speier. Moncada is a natural second baseman, but can play multiple positions. Even though the Red Sox have second baseman Dustin Pedroia is under contract through 2021, Cherington confirmed the Cuban star will �probably� be at second to start camp. 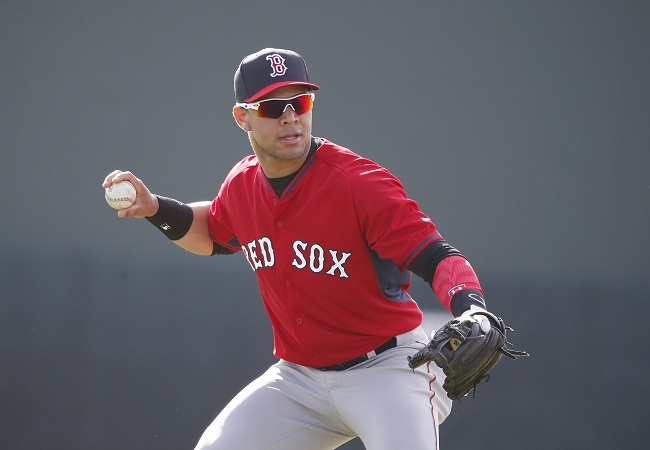 There was an outside chance that Moncada � who had private workouts with around 11 teams � never landed in Boston, as the Yankees were in the bidding mix right up until the end. Once Moncada settles into a routine in at the club's complex in Fort Myers, Cherington said Moncada would probably start his Red Sox career in Single-A Greenville.